The #MilesForAMillion team have raised more than a million! 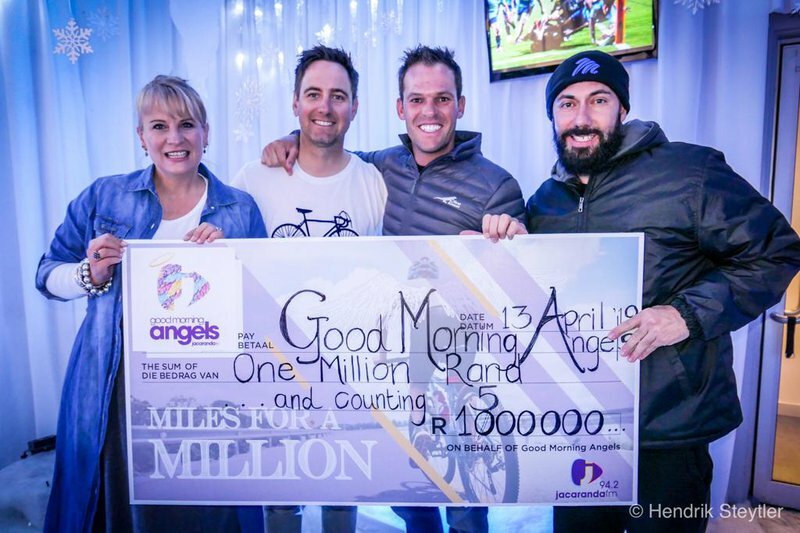 Three mountain bike enthusiasts cycled more than 1,700km with the goal of raising R1-million for Jacaranda FM’s Good Morning Angels - and they did just that and more! Hendrik Steytler, Deon Brink, and Ivor Potgieter visited various towns along the way while exploring South Africa in all its glory. On Saturday, they ended their extraordinary journey at Jacaranda FM & Tracker’s Off the Beat ‘n Track – a family fun day of mountain biking and music that took place at The Big Red Barn, Irene. The #MilesForAMillion journey was not easy. The three bikers were vulnerable, but they did not give up. Throughout last week, Martin Bester had catch-up calls with the team and they were extremely emotional. Over the weekend they reached their goal and made R1.5-million. What an achievement! The Breakfast with Martin Bester team invited Hendrik and Ivor to the studio to talk about their journey.